Apart from adjusting Pull Compensation, how do I make each stroke of ESA font thicker, and appear to be bold typeface? Or make it look like thin typeface face? I know this is not a proper way, but is there a quick way to do so, without properly digitising the Bold typeface? For example, there's Helvetica font included, but I would like to make Helvetica Bold. 3 months 13 hours ago	#1287 by Pascale R.
Replied by Pascale R. on topic How do I make ESA font bold (or thin)? Hey Antony - That's a good question. I find making a letter thinner more difficult though, usually requiring moving nodes. 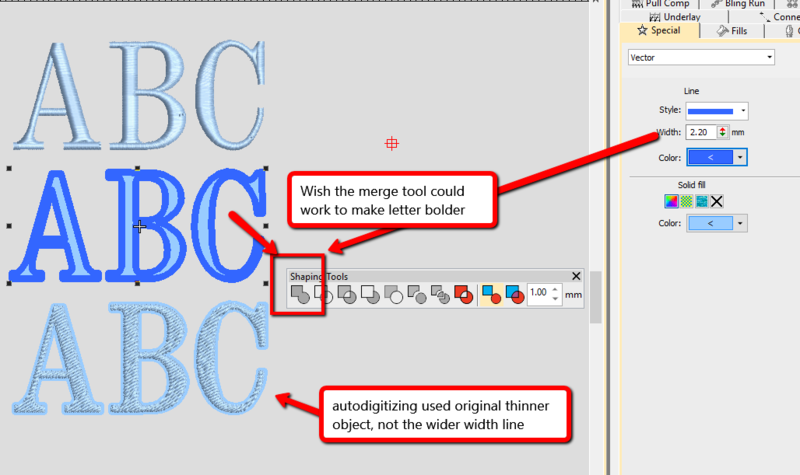 I know this isn't doable (at least, I haven't figured out a way yet), but i wish one could take the letter, convert to graphic, adjust the line width (to make it bolder), then convert it back to stitches. While it converts back to stitches, it only recognizes the original shape (not the bolder one). I wish there was a way to weld the two together. (same scenario applies if one takes the letter, increases column width, then convert to graphic --- the result is the original thinner version).